Will their game include Sammy Hagar and Michael Anthony? Eddie Van Halen is a guitar hero - that much we know. But these days you're not a REAL guitar hero till you're in a video game. 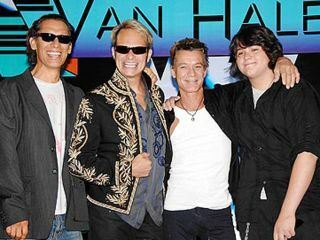 And rumor has it, Van Halen is the next band up for the Guitar Hero franchise. Following in the footsteps of Aerosmith and Metallica (whose version is set for 29 March release), Guitar Hero: Van Halen would be specifically branded for that band and will feature many of the group's best-loved hits: Jump, Panama, Hot For Teacher...gee, do you think they'll include Eruption? Will game feature all band members? Does the band discover brown M&Ms in their dressing room? Will Valerie Bertinelli make an appearance? Details are sketchy, at best, but the possibility of a Van Halen Guitar Hero game raises certain questions: Would it encompass the entire career of the band, and if so, will there be Michael Anthony and Sammy Hagar characters? And what about the storylines? Does the band discover brown M&Ms in their dressing room? Will Valerie Bertinelli make an appearance? (Personally, we could go for that!) Do players get to jam on Eddie's solo to Michael Jackson's Beat It? These are things we must know! Unfortunately, we may not find out the answers to these burning questions until the fall, which is the soonest Guitar Hero: Van Halen could be out. And what better time to compete with The Beatles: Rock Band?